My goodness, another year gone and a new one started. How many New Years resolutions have you made and broken already? How many games did you buy in the Steam Winter Sale? Me, zero. But I was gifted a game, so thank you very much – you know who. The weather here in Northern Spain has been fantastic this winter but I know some of you have had a terrible time and you have my sympathy. So, let’s start the new year with some chat – off you go. My new years resolution is to put more time into a particular little project I am working on in order to get it finished. I also intend to start putting out more content online, such as mod playthroughs and reviews. Hopefully at some point this year I’ll be upgrading my internet service so that I can look into streaming. HEY BIG SPENDING, Spend a little time with me. What are people’s thoughts on all this ARG stuff? I’m usually very skeptical myself when these things happen as I know Valve like to drop HL references around in their products nowadays with no real meaning to them, I saw this sale ARG yesterday and didn’t think much of it, especially because the whole theme of gingerbread and candycanes seemed so out of Half-Life’s tone, until this morning when a ton of people messaged me to cover it on LambdaGeneration. There now seems so many references, especially the HL2 logo + crowbar hidden in the wallpaper that either Valve is just messing with us or it’s the real thing. I’d usually be more inclined after recent times to believe the first, but seen as they are under a lot of fire for the Xmas security debacle, I have reason to doubt they would dare upset anyone anymore with this. We will see what happens, maybe it will be some update to Steam or TF2 or something, but they are going past the point of return with the whole HL thing right about now. Ok update, Marc sent an email out, which is real, that may have put this to rest. Then again, you can’t be sure if he’s told to say that or there’s internal secrecy. You can be sure that it’s not an ARG. They’re not stupid. It worked *once*. Portal 2’s ARG was brilliant, and solved within literally hours of its inception. Their servers already crashed hard from the DDOS and cache problems, *why would they compound those* by starting an ARG? It’s not impossible, but it’s extraordinarily unlikely that after their issues, they’d jump headlong into this. When HL3 is announced, it’ll be fully done, no beating around the bush, and the entire internet will lose its collective mind. They need no ARG for that to happen. Eh, it’s just for fun. This ARG has already resulted in a Red Herring badge, thanks to some intrepid Steam detectives who figured it out. So, it’s not like there’s nothing to it. Whether or not there’s more, who knows. I don’t think we’re headed for Half-Life 3 anytime soon, but I think HL fans just have to accept that either Valve is trolling them, or Valve wants to make references without implying that they are anything more than that – references. Probably not HL3, but it’s certainly an ARG of some sort. New audio file found for example with phonetic alphabet code. My bet is it’s something related to this. Just wondering how Leon is making out with the loss of his mother. I was following the comments but they seem to have vanished,here and on moddatabase. Wish him all the best for the New Year. He is hoping for either the first or second week of January. Once I know more, I’ll update everybody. I just thought I’d drop a line to let everyone know the long in the coming Wilson Chronicles is available through steam for free…and I’m mid-download. Can’t wait to see how it is. Yes, I hope to be adding it to the site this weekend, as well as streaming it. There will also be an audio interview with the team soon. Soooo I’m really tired of the universe taking back its wandering people. Lemmy, Bowie, Rickman, what is next, please don’t answer. :/ After losing Breen’s voice actor, I definitely don’t want to hear about anyone on the Valve-related gaming front vanishing back to the stars. Hey is anyone else (I know there’s at least one player) experiencing an error with the models for the crossbow, bolts, custom items (like the ‘camera’ in other life hatch 18), and rockets / rocket launcher? It’s funny to see the big glowing flashing ERROR message as it flies off into the sky and explodes, but… it’s *broken*, and I can’t figure out why. Is this because of the SDK 13 beta? I didn’t notice having this issue before using that, but I’m not positive that would be it. I’m currently verifying all my hl stuff including the source sdk 13, so hopefully that will fix it (and I’ll say if it does) but right now it’s just annoying as heck to see that happen in all my mods. That’s generally because the mod has not been updated to run on Steampipe. Is there a horrible hack that Gauge can be given to fix that? >_> I know hacky software is bad software but… Played Outpost 16 a little last night too and watching the helicopter fire ERRORS and the crossbow fire ERRORS… And I had to give up on the other one I was playing (hatch 18) because the floating, ever-present and ever-flickering ERROR above my character’s view made me physically ill after a few minutes. It does that already, but some mods are harder to fix than others. I’ve been running these with Gauge, so while it does fix the intro / menu map if there is one, this issue still comes up regardless. what happened to the snarkpit.net? I contacted Eric AKA Riven a few weeks ago letting him know it was down but haven’t heard anything back. Just found a new web comic via the Half-Life Reddit called “Combine Exchange Program”. I generally don’t like these sorts of things, but I have to admit I smiled. Aw, really? I put a lot of work into mine, that saddens me a bit. Still, to each his own. I’m glad you enjoyed Mjolnir’s Combine Exchange Program though, his work is absolutely brilliant. You should wait till you see Kenny the Cop, a classic from the old days he’s in the process of bringing back online. The early issues are terribly outdated visually, but the humor is extremely good! Some people aren’t “comic” people. That doesn’t mean I don’t recognize the hard work and effort that goes into them. Yes, of course, I understand. I suppose I worded it a bit incorrectly, I didn’t mean to make it all about me. I just invest way too much of my free time on the subject, apologies for acting a bit self-centered in turn. Although, I’ve actually been tempted to link my own stuff around here, but always avoided to. Don’t feel like coming across as a self-promoter, I’d rather people just find it on their own, even if it is through Reddit. 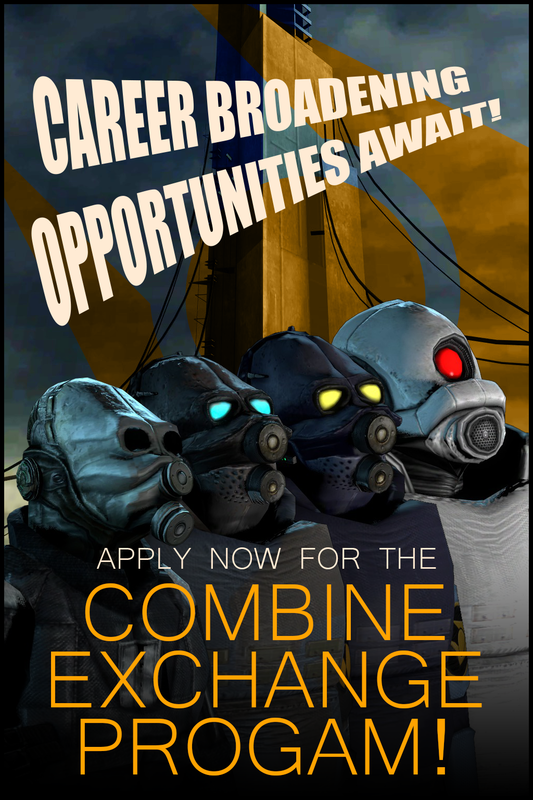 In any case, hope you’ll at least give Combine Exchange Program some of your time as there’s more to come in the future from what I hear! Oh, also, here’s Episode 4! Just found out about Prospekt add on the web supposed to be released on steam Feb 11 for 10 dollars. It has valves approval and is approx. same size as Hl2 Ep 1. I will be interviewing the author once I have played a preview of the game. Thanks for the info on it. Will keep comments on that post. I didn’t link to the poll to force your comments there. I’m happy to talk about it here too, I just thought you might like to know about the poll, that’s all. Been a bit away from RTSL for a little while, lots of work getting in the way. I was just catching up on the Discussion Thread and realizing… man, what a depressing month January has been! All the passings of famous people so far, then in the Half-Life front, the ARG that went nowhere and Marc Laidlaw leaving Valve (of his own volition, of course, but still, HL3 already feels less special to me). Really hope the year picks up after this. I don’t often drool over cars but in this case I’ll make an exception. Well I just finished a re-play through of G-String Beta (as it is no known) in preparation for the release of the new final release of G-String. My goodness I’d forgotten just how amazing it was….tough but very worth the replay! Can’t wait for the new and final version. Is the submit a map feature only for maps that the submitter made? I found one that’s not on the site (it’s not made by me). Sure, submit it and let me have as much information as you can. If it is on the Pending page, then I already know about it. No, you can go ahead and submit one you find that’s not on the site.